Amos: They said sister is stranded on the highway. Her car is about 10 miles east of town. it’ll be smashed by tonight. and laugh at Magpie on the fence. Amos: Mom, I’m taking Myrna to help sister. Her car quit and I might have to tow her in. aren’t damaged. It’s got long hair, too. Porcupine: Clouds are fading. Earth is cooling. Grass is calling me home. Amos: There she is. She put something in her trunk. It looks like a big old porcupine. Sister: This sure is a mess. I should skin it here. All the cats will be coming into the yard. entrails for health and weather. Amos: What happened? Did you break down? Don’t tell me, you’re scavenging road kill? stalled, then I saw this huge porcupine. Amos: Pull your hood latch. Your cable was loose. Take it home and skin it. We’ll follow you. brother some armbands. Surprise them. dreamed about a big porcupine on the highway. 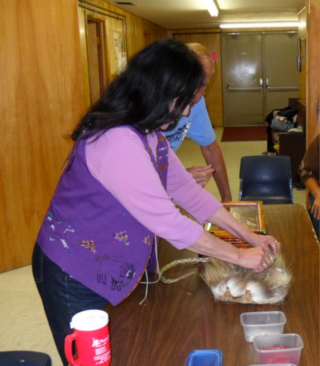 The Porcupine is very significant in the D/Lakota culture as it teaches patience and skill to the persons who use the quills. The persons have a vision and become quill workers. This skill is regarded as being equivalent to a warrior status. On my reservation my mother, sisters and I are known to be quill workers, we belong to the Quill Worker Society and teach quill work. from the vanishing of breath. Her knife slashes her arms. to let her know, why she had to stay. “Take her hands” are words Sioux women say when someone is overwhelmed. When a woman intentionally takes the hands of another, it is to console them. Prayer is shared to keep the grieving spirit here in this time and place and to remind of their earth responsibilities. Sometimes grief can be extremely difficult and the spirit may leave or wander. Lois Red Elk is descended from the Isanti, Hunkpap, and Ihanktowan bands of the Dakota/Lakota Sioux Nation. Her father, James Red Elk is a descendent of the Sitting Bull family, and her mother spoke five different languages, French, Latin, Sioux, Assiniboine and English. 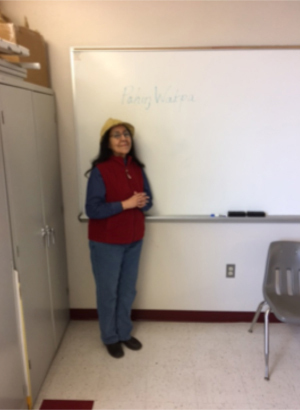 She enjoys writing poetry and prose and practices the art of porcupine quill embroidery. She has a Human Services Degree from Ft. Peck Community College and an Education Degree from Rocky Mountain College. Married to her dear friend and husband Dennis, they have two children and eight grandchildren.